Property Location With a stay at Bay View Resort in Myrtle Beach, you&apos;ll be on the beach and minutes from Mount Atlanticus Miniature Golf and close to Broadway at the Beach. 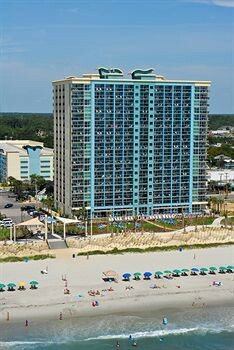 This beach condo is within close proximity of SkyWheel Myrtle Beach and Family Kingdom Amusement Park.Rooms Make yourself at home in one of the 250 air-conditioned guestrooms. Rooms have private balconies. Complimentary wireless Internet access is available to keep you connected. Bathrooms have shower/tub combinations and hair dryers.Rec, Spa, Premium Amenities Take advantage of recreational opportunities offered, including an indoor pool, a lazy river, and a spa tub.Dining Enjoy a satisfying meal at a restaurant serving guests of Bay View Resort.Business, Other Amenities Featured amenities include a 24-hour front desk, laundry facilities, and ATM/banking services.